At that time R+ team was doing their “Made in Germany” tour in United States. We had the opportunity to witness a colossal enterprise, perfectly organized in every detail. The magnitude of this tour was reflected by the numerous trucks which were parked behind the Denver Coliseum with tons of equipment for the show. I don’t think there has been any band ever going through such immense display of power. A true heavy industrial metal act. We were really impressed by the calculated sobriety of about twenty people working fast behind the stage, preparing the show. The tour manager, Heike, a young lady, was in charge of the preparations, and doing a perfect job. But, the true beauty of this incredible band is that, next to their robust German machinery, the R+ members were modest, a bit sad, and also kind and friendly. This combination of immense power and good heart is what makes the greatness of Rammstein. The CMB kids went on stage calm and quite confident, in part because they felt the protection and friendliness of these heavy minstrels. 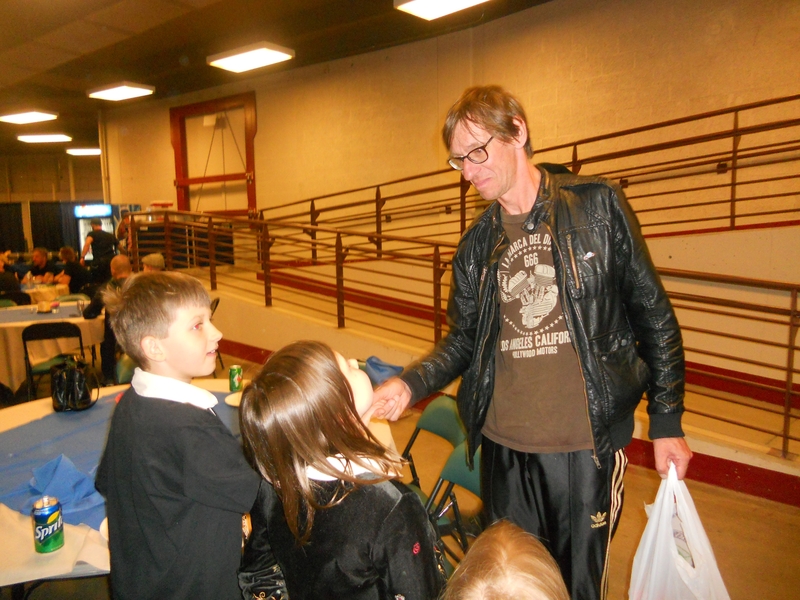 It was such an interesting experience for the kids and we should be thankful to this great band for their hospitality. We shouldn’t also forget Joe Letz, who discovered CMB online and showed our videos to the Rammstein team. Thank you, Joey! Following our covers of Ich Will and especially Sonne, all of a sudden people started to notice this young band. Things went on developing fast and on the evening of May 19th 2012, we received a surprising email from Rammstein’s tour manager. They would have liked the kids to go on stage and perform a few songs on the very following day at Denver Coliseum (!!!). This wasn’t our first contact with the R+ administration team. We had been in touch with them for 2-3 weeks before the Denver show. They had posted our Sonne cover on their site and sent us emails regarding a possible meeting with the R+ musicians. We were happy for such opportunity, we’ve always admired the R+ musicians and their wonderful songs, but didn’t plan to attend their live show, it wasn’t something for the kids to watch. We only wanted to meet the Rammstein team before the show. So we informed them through an email about our location in the Denver area and the meeting day was pre-arranged for May 20th. But the kids were excited about it! We asked Cornelia (not yet 6 at the time) if she really wanted to go on stage. “Yes! !” was her answer. 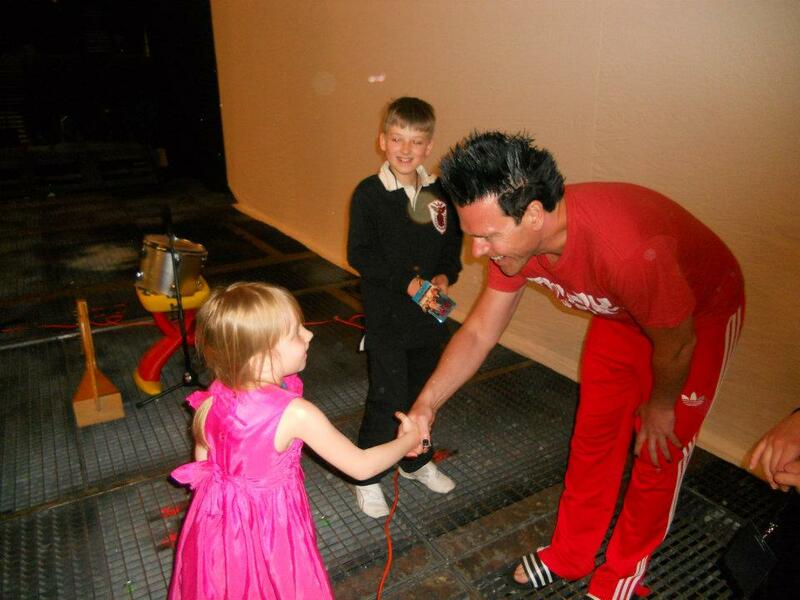 “Ok, but won’t you be scared in front of thousands staring at you?” She froze for a moment and then she calmly replied: “If I get scared, I’ll say a quick prayer and I’ll pretend I am at home practicing in our room.” This little girl’s answer convinced us to take chances and let them go on stage. One of our principles is that we should always take into consideration the kids’ instincts. The upbringing is for their benefit, not ours, and we can never be too sure of how much they sense, or foresee their own future, and what they need for it. So we decided to follow the kids’ decision, but we’ve been unsure about it all the way. We went there ready to cancel if things didn’t look right. However, when we met the team members: Heike – the tour manager, Joe Letz who tried to assure us that nothing will go wrong, and then the R+ musicians themselves who were very friendly, sober and very gentlemanish, our worries went away. The CMB kids love fairy tales and have an interest in the medieval culture. So they really enjoyed meeting these powerful knights without armor, fierce but also kind and gentle. It was a memorable evening. 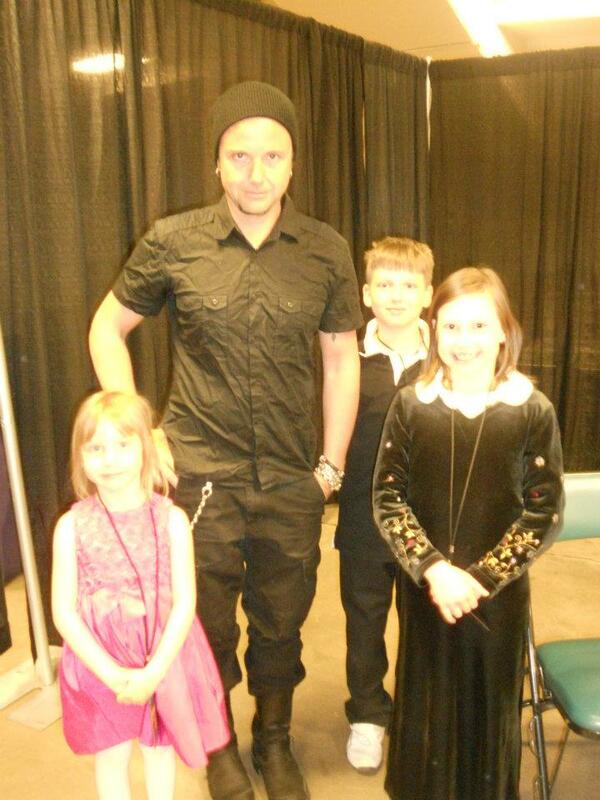 The kids had interesting discussions with the Rammstein musicians. They took pictures together. Christoph Schneider (R+ drummer) gave the little Cornelia several pairs of his own custom made drumsticks. It was great to hear from such reputable artists that they had watched our videos and liked them. A few highlights: the official meeting was short and formal, set for 7:55 (Germanic punctuality) until 8:15, in a special room, prepared for such events. We shook hands, received autographs and took pictures together. 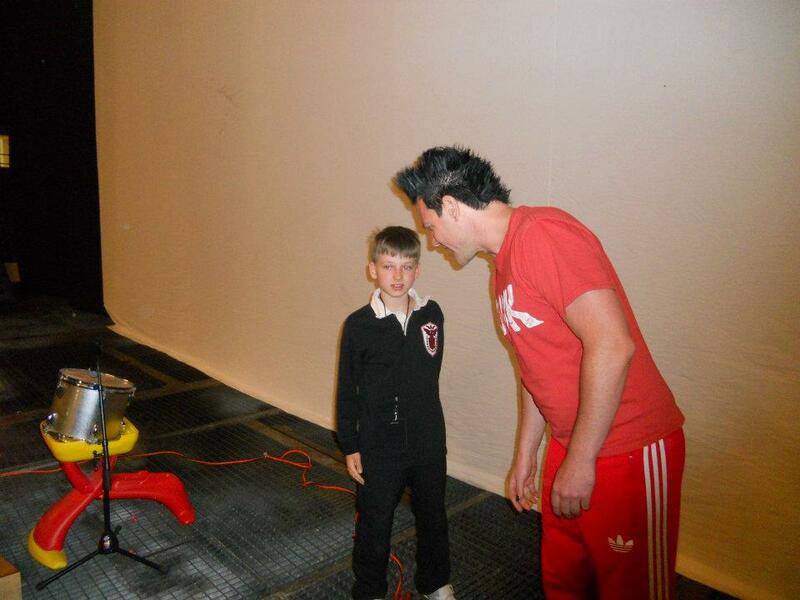 At one point Richard Kruspe asked Cornelia how old is she. A little confused, she didn’t know the answer. We helped: “she is 5 and 11 months”. Richard: “it’s so funny, she knows how to play drums, but doesn’t know her age”. Joe Letz asked specifically when is her birth day, so we found out that Richard and Cornelia almost share the same birth day, just one day apart. Richard, a little sad and meditative: “yes, but so many years apart”. Till Lindemann, looking distant and worried, came in to see us. Stefan jumped up to shake his hand. Till, rough as usual, pushed him aside: “not you, ladies first!” and went on to shake hands with Olga and Cornelia. Then finally Till turned back to Stefan with a much friendlier attitude. Great gentleman! 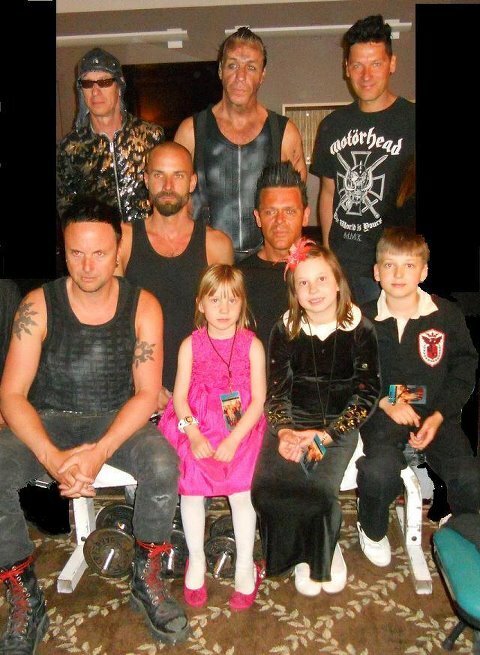 Then, later during the kids’ show, their dad and three of Rammstein band (Paul, Richard and Oliver) were watching from the side of the stage. After “Ich Will”, dad was screaming at Stefan trying to get his attention through the audience roar. Paul, concerned: “what happened?” “I want to remind him to tune the guitar a bit!” Paul:” don’t worry, they love it anyway:-)”. Hopefully one day we’ll have the time to write a more detailed story about those special moments. Click on the pics for bigger size. On May 20th 2012, the kids from Children Medieval Band played live as an opening act for the Rammstein show, in front of 10,000 people. It was a great audience. The kids performed very well. If we consider their lack of experience on stage, the numerous audience, and also the sound which was very different from what they got used to, their performance was a great A+. These videos don’t reflect well the quality of the show, but this is the best we got. We would like to thank the Rammstein band members for their great gesture of inviting Children Medieval Band to play on their stage. <8 ^ O……. I… I… I… I am not worthey! All respects from Finland! Rock on! I was at this show and LOVED seeing your children have this opportunity. The crowd absolutely adored them. I will never have kids, but if I had chosen to do so, I could only hope that I would raise them half as well as you have done so far. Gives me a little hope for the future…. Thank you, Greg, much appreciated! Sorry for the late answer, didn’t check the comments for a while. About the homeschooling, yes, I’m available for questions.